Habaki :Gold wrapped single habaki. Blade length : 70.5 cm or 27.76 inches. Sori: 1.6cm or 0.63 inches. Width at the hamachi :3.02 cm or 1.189 inches. 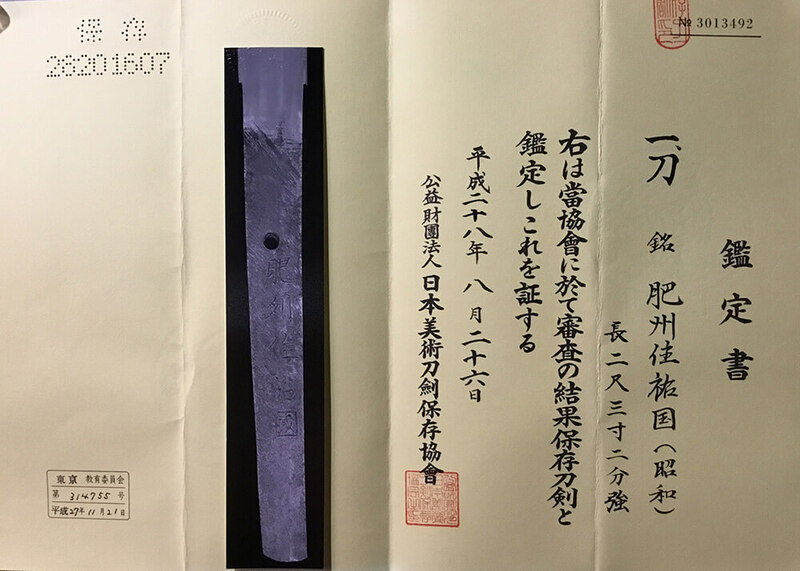 Width at the Kissaki : 2.315 cm or 0.91inches. Kasane :0.71 cm or 0.28inches. Shape : The blade is rather wode and thick woth deep sori and longer kissaki. Jigane :Itame hada well grained with jinie attach and visible to see the texture. Hamon :Niedeki suguha. Boshi is round shape. Probably he helped maaking swords for his master for his life. Koshirae : Handachi style Koshirae. Tsuba :On the iron mokko style tsuba, rise up Mimi slightly. Menuki : a big size dragon is engraved by syakudo plate. Kurokata:On the shibuichi plate, Kanji Shinshi Cyusyo is engraved. Kojiri: On the iron plate, the edge is engraved gold line. but the blade passed NBTHK Hozon Token as Syowa blade. But I think the blade looks shinshinto blade. The blade will be used as Iai practice or Kansyo blade. Koshirae is very attractive late Edo period nice Koshirae.